(Newser) – Sporting a leather jacket, dyed red hair, and tattoos, Alisa Aarniomaki looks like she's on her way to band rehearsal. But instead of a guitar, the 20-year-old Finn gently holds on to something else: a puffy stuffed horse head on a wooden stick complete with glued-on eyes, mane, and reins. 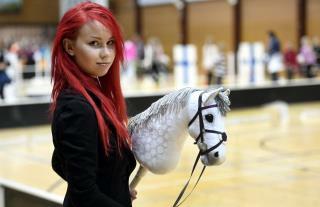 She's been riding real horses from the age of 10 but became instantly smitten by hobby-horsing—a sport with gymnastic elements that has spawned a social media subculture among Finnish teen girls—when she first heard about it several years ago, reports the AP. "Hobby-horsing has a strong therapeutic side to it," says Aarniomaki, adding that it has helped her deal with her parents' divorce and bullying. "It has helped me a great deal that I can occasionally just go galloping into the woods with my friends. It somehow balances my mind." Finnish girls are pretty awesome. Just sayin'.